^ Merriam Webster 1996, p. 1416. ^ 2.0 2.1 2.2 Ramen 2001, p. 8. ^ 4.0 4.1 Dederichs 2009, p. 92. ^ Dederichs 2009, p. 11. ^ Gerwarth 2011, pp. 14–15, 18. ^ Gerwarth 2011, p. 14. ^ Gerwarth 2011, pp. 14, 20. ^ 9.0 9.1 Dederichs 2009, p. 28. ^ Gerwarth 2011, p. 28. ^ Gerwarth 2011, p. 24. ^ Dederichs 2009, pp. 23, 28. ^ Lemons 2005, p. 225. ^ Gerwarth 2011, pp. 28, 29. ^ 15.0 15.1 Gerwarth 2011, p. 30. ^ Waite 1969, pp. 206–207. ^ Gerwarth 2011, pp. 32, 33. ^ Gerwarth 2011, p. 34. ^ Gerwarth 2011, pp. 37, 38. ^ Gerwarth 2011, pp. 39–41. ^ Gerwarth 2011, pp. 43, 44. ^ Gerwarth 2011, pp. 44, 45. ^ Calic 1985, p. 51. ^ 24.0 24.1 Williams 2001, pp. 29–30. ^ Gerwarth 2011, pp. 51, 52. ^ 26.0 26.1 26.2 Longerich 2012, p. 125. ^ Gerwarth 2011, p. 52. ^ Gerwarth 2011, pp. 55, 58. ^ Gerwarth 2011, pp. 110, 111. ^ 30.0 30.1 Dederichs 2009, p. 12. ^ Gerwarth 2011, p. 53. ^ 32.0 32.1 United States National Archives (NARA). ^ Gerwarth 2011, pp. 56, 57. ^ Calic 1985, p. 72. ^ Gerwarth 2011, p. 58. ^ 36.0 36.1 36.2 36.3 36.4 Gerwarth 2011, p. 61. ^ Williams 2001, p. 38. ^ Shirer 1960, pp. 196–200. ^ Shirer 1960, p. 226–227. ^ 42.0 42.1 Shirer 1960, p. 271. ^ Shirer 1960, pp. 270–271. ^ Longerich 2012, p. 165. ^ Kershaw 2008, pp. 306–307. ^ Kershaw 2008, pp. 309–12. ^ Flaherty 2004, pp. 56, 68. ^ Williams 2001, p. 66. ^ Williams 2001, p. 77. ^ Weale 2010, p. 132, 135. ^ Calic 1985, p. 157. ^ Kershaw 2008, pp. 358–359. ^ Kitchen 1995, p. 40. ^ Delarue 2008, p. 85. ^ Blandford 2001, pp. 135–137. ^ Evans 2005, p. 655. ^ Lehrer 2000, p. 55. ^ Lehrer 2000, p. 61–62. ^ Goldhagen 1996, p. 158. ^ Kershaw 2008, p. 696. ^ Dederichs 2009, p. 83. ^ 68.0 68.1 Williams 2001, p. 85. ^ Blandford 2001, p. 112. ^ Williams 2001, p. 88. ^ Conquest 2008, pp. 200–202. ^ Bracher 1970, p. 418. ^ 75.0 75.1 Williams 2003, p. 82. ^ Horvitz & Catherwood 2006, p. 200. ^ 77.0 77.1 Bryant 2007, p. 140. ^ 78.0 78.1 78.2 78.3 Bryant 2007, p. 143. ^ Paces 2009, p. 167. ^ 80.0 80.1 80.2 Williams 2003, p. 100. ^ 81.0 81.1 81.2 Bryant 2007, p. 144. ^ Garrett 1996, p. 60. ^ MacDonald 1989, p. 133. ^ Goldsworthy 2010, p. 229. ^ Dresner 1998, p. 1199. ^ Donnelley 2012, p. 48. ^ 101.0 101.1 Aly 等人 2004, p. 5. ^ Hillgruber 1989, pp. 94–96. ^ 103.0 103.1 Hilberg 1985, p. 164. ^ Bloxham 2009, p. 228. ^ 115.0 115.1 Williams 2003, p. 155. ^ 119.0 119.1 Dederichs 2009, pp. 148–150. ^ 122.0 122.1 Dederichs 2009, p. 107. ^ 123.0 123.1 123.2 Lehrer 2000, p. 87. ^ Dederichs 2009, p. 176. ^ Gerwarth 2011, p. 291. ^ Gerwarth 2011, pp. 77, 83, 113, 289. ^ Browder 2004, p. 260. ^ Lehrer 2000, p. 58. ^ 129.0 129.1 Dederichs 2009, p. 152. ^ Dederichs 2009, pp. 153–155. ^ Craig 2005, p. 189. ^ Gerwarth 2011, p. 280. ^ Calic 1985, p. 253. ^ Frucht 2005, p. 236. ^ Arad 1987, p. 13. ^ Gerwarth 2011, pp. 73–75. ^ 140.0 140.1 Yerger 1997, p. 17. ^ Gallagher 1969, pp. 143–145. ^ Schellenberg 2000, pp. 19–21. ^ Fitzgibbon 2000, pp. 276–302. ^ National Archives and Records Administration (SS officer record rolls). ^ Ernst 1971, pp. 117–121. ^ Gerwarth 2011, pp. 174, 196, 197. ^ Gerwarth 2011, p. 197. ^ Gerwarth 2011, p. 279. ^ Gerwarth 2011, p. 174. Aly, Götz; Roth, Karl Heinz; Black, Edwin; Oksiloff, Assenka. The Nazi Census: Identification and Control in the Third Reich. Philadelphia: Temple University Press. 2004. ISBN 978-1-59213-199-0. Arad, Yitzhak. Belzec, Sobibor, Treblinka: The Operation Reinhard Death Camps. Bloomington, IN: Indiana University Press. 1987. ISBN 978-0-253-34293-5. Blandford, Edmund L. SS Intelligence: The Nazi Secret Service. Edison, NJ: Castle Books. 2001. ISBN 0-7858-1398-5. Bloxham, Donald. The Final Solution: A Genocide. New York: Oxford University Press. 2009. ISBN 978-0-19955-034-0. Bracher, Karl Dietrich. The German Dictatorship: The Origins, Structure, and Effects of National Socialism. New York: Praeger. 1970. ISBN 978-1-12563-479-0. Browder, George C. Foundations of the Nazi Police State: The Formation of Sipo and SD. Lexington: University Press of Kentucky. 2004. ISBN 978-0-8131-1697-6. Browning, Christopher R. The Origins of the Final Solution : The Evolution of Nazi Jewish Policy, September 1939 – March 1942. Comprehensive History of the Holocaust. Lincoln: University of Nebraska Press. 2004. ISBN 0-8032-1327-1. Bryant, Chad Carl. Prague in Black: Nazi Rule and Czech Nationalism. Cambridge, MA: Harvard University Press. 2007. ISBN 978-0-674-02451-9. Burian, Michal; Knížek, Aleš; Rajlich, Jiří; Stehlík, Eduard. Assassination: Operation ANTHROPOID, 1941–1942 (PDF). 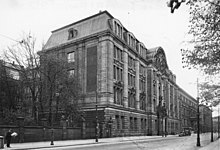 Prague: Ministry of Defence of the Czech Republic – AVIS. 2002. ISBN 978-80-7278-158-4. （原始内容 (PDF)存档于2016-06-02）. Calic, Edouard. Reinhard Heydrich: The Chilling Story of the Man Who Masterminded the Nazi Death Camps. New York: Morrow. 1985 . ISBN 978-0-688-00481-1. Conquest, Robert. The Great Terror: A Reassessment. Oxford: Oxford University Press. 2008 . ISBN 978-0-19-531700-8. Craig, John S. Peculiar Liaisons: In War, Espionage, and Terrorism in the Twentieth Century. New York: Algora. 2005. ISBN 978-0-87586-331-3. Dederichs, Mario R. Heydrich: The Face of Evil. Drexel Hill, PA: Casemate. 2009 . ISBN 978-1-935149-12-5. Delarue, Jacques. The Gestapo: A History of Horror. New York: Skyhorse. 2008 . ISBN 978-1-60239-246-5. Donnelley, Paul. Assassination!. United Kingdom: Lulu Publishing. 2012. ISBN 978-1-908963-03-1. Dresner, Denise. The Hutchinson Encyclopedia 18. Oxford: Helicon. 1998. ISBN 978-1-85833-951-1. Ernst, Frank. Karl Hermann Frank, Staatsminister im Protektorat. Heusenstamm: Orion-Heimreiter. 1971. ISBN 3-87588-071-4. Evans, Richard J. The Third Reich in Power. New York: Penguin Group. 2005. ISBN 978-0-14-303790-3. Fitzgibbon, Constantine. Commandant of Auschwitz : The Autobiography of Rudolf Hoess. London: Phoenix Press. 2000. ISBN 978-1-84212-024-8. 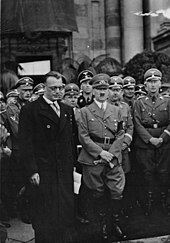 Flaherty, T. H. The Third Reich: The SS. Time-Life Books. 2004 . ISBN 978-1-84447-073-0. Frucht, Richard C. Eastern Europe: An Introduction to the People, Lands, and Culture. Santa Barbara, CA: ABC-CLIO. 2005. ISBN 978-1-57607-800-6. Gallagher, J.P. Scarlet Pimpernel of the Vatican 1st. London: Fontana. 1969. Garrett, Stephen. Conscience and Power: An Examination of Dirty Hands and Political Leadership. New York: St Martin's Press. 1996. ISBN 978-0-312-15908-5. Gerwarth, Robert. Hitler's Hangman: The Life of Heydrich. New Haven, CT: Yale University Press. 2011. ISBN 978-0-300-11575-8. Goldhagen, Daniel Jonah. Hitler's Willing Executioners: Ordinary Germans and the Holocaust. New York: Knopf. 1996. ISBN 978-0-679-44695-8. Goldsworthy, Terry. Valhalla's Warriors: A History of the Waffen-SS on the Eastern Front 1941-1945. Indianapolis, Indiana: Dog Ear Publishing. 2010. ISBN 978-1-608-44639-1. Headland, Ronald. 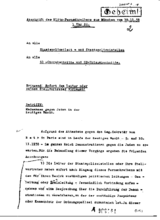 Messages of Murder: A Study of the Reports of the Einsatzgruppen of the Security Police and the Security Service, 1941–1943. Rutherford, N.J: Fairleigh Dickinson University Press. 1992. ISBN 978-0-8386-3418-9. Hilberg, Raul. The Destruction of the European Jews. New York and London: Homles & Meier. 1985. ISBN 0-8419-0910-5. Hillgruber, Andreas. War in the East and the Extermination of the Jews. (编) Marrus, Michael. The "Final Solution": The Implementation of Mass Murder. The Nazi Holocaust, Part 3 1. Westpoint, CT: Mecler. 1989. ISBN 978-0-88736-255-2. Höhne, Heinz. The Order of the Death's Head: The Story of Hitler's SS. London: Penguin. 2000 . ISBN 978-0-14-139012-3. Horvitz, Leslie Alan; Catherwood, Christopher. Encyclopedia of War Crimes and Genocide. New York: Facts On File. 2006. ISBN 978-0-8160-6001-6. Kershaw, Ian. Hitler: A Biography. New York, NY: W. W. Norton & Company. 2008. ISBN 978-0-393-06757-6. Kitchen, Martin. Nazi Germany at War. New York, NY: Longman. 1995. ISBN 0-582-07387-1. Lehrer, Steven. Wannsee House and the Holocaust. Jefferson, NC: McFarland. 2000. ISBN 978-0-7864-0792-7. Lemons, Everette. The Third Reich, A Revolution Of Ideological Inhumanity: The Power Of Perception. Lulu Press. 2005. ISBN 978-1-4116-1932-6. Longerich, Peter. Heinrich Himmler: A Life. Oxford: Oxford University Press. 2012. ISBN 978-0-19-959232-6. MacDonald, Callum. The Killing of Reinhard Heydrich: The SS 'Butcher of Prague'. New York: Da Capo Press. 1989. ISBN 978-0-306-80860-9. McNab, Chris. The SS: 1923–1945. London: Amber Books. 2009. ISBN 978-1-906626-48-8. Merriam Webster's Collegiate Dictionary Tenth. Springfield, MA: Merriam-Webster. 1996. ISBN 0-87779-709-9. Paces, Cynthia. Prague Panoramas: National Memory and Sacred Space in the Twentieth Century. Pittsburgh: University of Pittsburgh Press. 2009. ISBN 978-0-8229-6035-5. Ramen, Fred. Reinhard Heydrich: Hangman of the Third Reich. New York: Rosen. 2001. ISBN 978-0-8239-3379-2. Reitlinger, Gerald. The SS: Alibi of a Nation, 1922–1945. Da Capo Press. 1989 . ISBN 978-0-30680-351-2. Schellenberg, Walter. The Labyrinth: Memoirs of Walter Schellenberg, Hitler's Chief of Counterintelligence. Boulder, CO: Da Capo Press. 2000. ISBN 978-0-306-80927-9. Sereny, Gitta. Albert Speer: His Battle With Truth. New York: Vintage. 1996 . ISBN 978-0-679-76812-8. Shirer, William L. The Rise and Fall of the Third Reich. New York: Simon & Schuster. 1960. ISBN 978-0-671-62420-0. Snyder, Louis. Encyclopedia of the Third Reich. Da Capo Press. 1994 . ISBN 978-1-56924-917-8. United States National Archives; (NARA). 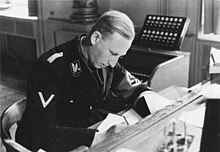 Reinhard Heydrich at the SS service record collection. College Park, Maryland. National Archives and Records Administration; (SS officer record rolls). SS service record of Friedrich Jecklen, RG 242. College Park, Maryland. Waite, Robert George Leeson. Vanguard of Nazism: The Free Corps Movement in Postwar Germany, 1918–1923. New York, NY: W. W. Norton & Company. 1969 . ISBN 978-0-393-00181-5. Weale, Adrian. The SS: A New History. London: Little, Brown. 2010. ISBN 978-1408703045. Williams, Max. Reinhard Heydrich: The Biography, Volume 1—Road To War. Church Stretton: Ulric Publishing. 2001. ISBN 978-0-9537577-5-6. Williams, Max. Reinhard Heydrich: The Biography, Volume 2—Enigma. Church Stretton: Ulric Publishing. 2003. ISBN 978-0-9537577-6-3. Yerger, Mark C. Allgemeine-SS: The Commands, Units, and Leaders of the General SS. Atglen, PA: Schiffer. 1997. ISBN 978-0-7643-0145-2. Aronson, Shlomo. 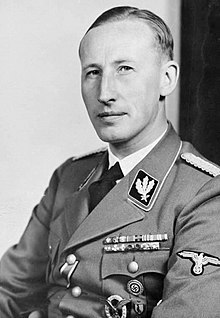 Reinhard Heydrich und die Frühgeschichte von Gestapo und SD. Stuttgart: Deutsche Verlags-Anstalt. 1984 . ISBN 978-3-421-01569-3. Fest, Joachim. The Face of the Third Reich: Portraits of the Nazi Leadership. New York: Da Capo Press. 1999 . ISBN 978-0-306-80915-6. Graber, G. S. The History of the SS. London: Robert Hale. 1996 . ISBN 978-0-7090-5880-9. Graber, G. S. The Life and Times of Reinhard Heydrich. Philadelphia, PA: David McKay. 1980. ISBN 978-0-679-51181-6. Heydrich, Lina. Leben mit einem Kriegsverbrecher [Life with a War Criminal]. Pfaffenhofen: Ludwig Verlag. 1976. ISBN 978-3-7787-1025-8. Reitlinger, Gerald. The SS: Alibi of a Nation 1922–1945. New York: Da Capo Press. 1989 . ISBN 978-0-306-80351-2. Schellenberg, Walter. The Labyrinth: Memoirs of Walter Schellenberg, Hitler's Chief of Counterintelligence. New York: Da Capo Press. 2000 . ISBN 978-0-306-80927-9. Schreiber, Carsten. Elite im Verborgenen. Ideologie und regionale Herrschaftspraxis des Sicherheitsdienstes der SS und seines Netzwerks am Beispiel Sachsens. Studien zur Zeitgeschichte; Bd. 77. München: Oldenbourg. 2008. ISBN 978-3-486-58543-8. Wiener, Jan G. The Assassination of Heydrich. New York, NY: Grossman Publishers. 1969. OCLC 247895. Williamson, Gordon. Loyalty is my Honor. London: Motorbooks International. 1995. ISBN 978-0-7603-0012-1.